Again Jakarta rocked by terror bombing on the 14 January. This was like the beginning of a new year greeting by terrorists to the people of Indonesia. Terror bombings and gunfire attacks occurred in Sarinah intersection in Jakarta and Starbuck's coffee outlets which were adjacent to it. At first, people did not think that it was a terrorist attack. They mostly assume that there was something like filming a movie on it. When it became clear to them that it was a terrorist attack, they would not shy away from the scene, but instead make the crowd to watch the event. ISIS whose based in Syria claimed responsibility for attacks in Jakarta. They stated that "The Khalifah's Soldiers" carried out the attack in Jakarta. This attack was carried out at a police station at the scene. President Jokowi himself, after the location of the terrorist attacks sterilized conduct inspections to ensure that the situation has completely overcome by security forces. Carrying four people in civilian casualties and four terrorists who died at the scene. Head of Jakarta Raya Metro Police, Inspector General Police Tito Karnavian ensure that mastermaind of a terror attack is a member ISIS named Bahrun Naim. Bahrun Naim was arrested by Detachment 88, the anti-terror detachment of the Police Mobile Brigade, setidaktidaknya once in 2010 on charges of terrorism in Indonesia. At that time, the media who claim to voice the interests of Islam as arrahmah.com defended Bahrun Naim and attempted to obscure the fact of the perpetrator. This attack makes the sense of community solidarity against the dangerous of terrorism be strengthened. Netizens also discussed this issue on social media. They were aware that the goal of terrorists was to create fear in the community, therefore they want to give a keen signal to the terrorists that the Indonesian were not afraid. Terrorism can not be associated with any religion because the purpose of terrorism was against humanity that taught by religion. After this event occurs, some of the handsome policeman who participated in acts of terror in the intersection discomfiture Sarinah became very famous. They became famous because of social media as a means of communication by netizens. One of them was Police Commissioner Krishna Murti. His current status on facebook always awaited by fans, mostly mothers and females. I got a link on Facebook from a friend of mine. This link was interesting because it showed that there are servants of the law in Indonesia that still cling to his conscience when deciding the case in court. Yes, he was a judge. His name is Judge Marzuki. Unfortunately I only pay attention to the story at the link on the face so that I forgot where and when this event occurred. An elderly woman from starvation stole a few sticks of cassava to eat her and his grandchildren. They had been a couple of days without eating and of course hunger. These cassava belonged to a large cassava planters in Indonesia. After the elderly grandmother was caught by security estates, the grandmother then reported to the police and the case was brought to court. Judge Marzuki was not able to hold his tears when he judge it. He apologized to the grandmother and stated that he could not make an exception. What indicted by the public prosecutor was proven in court. Judge Marzuki sentenced to pay a fine of one million rupiahs for the grandmother or replaced by confinement for two and a half years. After that, he removed his judge's hat and put the money of one million in the cap. Judge Marzuki also specify additional fines to all those presents at the hearing for fifty thousand rupiahs per person for allowing a family to starve in their city. Finally collected the sum of three million five hundred thousand rupiahs in a judge's hat. All the money was given to the grandmother. Including paying additional fines was the planter. How embarrassed he was. Currently in Jakarta was a commotion of murder committed by Jessica Kumala Wongso against her friend Wayan Mirna Salihin. Murder done using cyanide sprinkled into Mirna's coffee cups when they both were at a coffee shop. The coffee shop is Olivier Cafe in Grand Indonesia. In the CCTV footage shows how Jessica was sprinkled cyanide though not so obvious to the layman. However, the police make the CCTV footage as one evidence of murder. Jessica Kumala Wongso arrested by police without resistance at Neo Hotel, Mangga Dua, North Jakarta without resistance. The accused did for about a week staying at the hotel with her parents. This was justified by the neighboring Winardi, Jessica's father, Paul Sukiyanto. According to him, Winardi leave his home because they will seek peace by not staying at home. Jessica's Defense Team members, Andi Joesoef confirmed that his client was arrested in a luxury hotel in the North Jakarta area. There are several possible motives for the murder were revealed by the media. The first is the motive of romance. Suspected possibility that Jessica did not like about Mirna's marriage to her husband recently. This was of course denied by Jessica, she said she does have a few boyfriends on the past, but all of them were men. Another motive wass the motive of revenge carried. Previously, both had lived in Australia. Again, this was disputed by the suspect. There was no reason for revenge on Mirna, she said. The latter was the motive of business, but this was less likely. Netizens in Indonesia respond to this with a variety of interpretations. People think that Jessica is a psychopath. Jessica legal counsel team had stated that if it was true that Jessica was a psychopath, then he can be exonerated by law. Of course this was very surprising. Psychopathy is a mental disorder that is different from the example depression, schizophrenia or bipolar. The whole thing is probably a danger to others, but psychopathy is a personality disorder characterized by exploiting others, lies, arrogance and lack of empathy for others. I believe, should have been before the law, a judge must differentiate psychopathy with other mental disorders. Psychopathy can not be equated with schizophrenia, bipolar and depression. The law created a sense of security to the public. Is very dangerous if there is a psychopathic killer wandering the streets. In July last year, I finally managed to finish writing my novel. 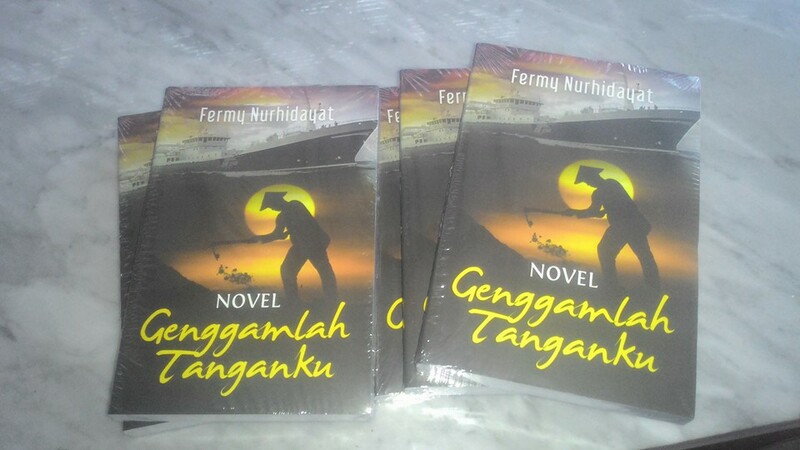 My novel was written in Indonesian and titled SMILED IN A GRIEF. Obviously I was delighted oncesince had managed to write a novel. People often think that writing is a talent. To some extent, it is true. But I am among those who believe that talent is acquired from practicing. Then I send it to the editor of Bentangpustaka Publisher. The first reason of course because I want my script could be enjoyed by fans of the novel. The second reason was because Bentangpustaka Publisher is placed in Yogyakarta, the town where I live, so that I couldn more easily connected to the publisher. Many friends who suggested that I should published the novel by self publishing, it was initially less interest me. It is, in fact, have the work published by mainstream publishers are more prestigious. When it became clear to me that the manuscript was rejected by Bentangpustaka, then I really publish it myself. In Indonesia there are publishers who helped us make the issuance of our own. Surely it is as well in your country, isn't it?. The novel was then I introduced it on facebook. It turned that reception of my friends on facebook was pretty good. Currently, the novel has been sold a hundred copies. I am currently writing my second novel, it is titled HOLD MY HAND. I hope this novel also get a pretty good response from friends on facebook later. My career as a writer seems to have begun here.